In 1995 the Mineral Point Chamber of Commerce began the Mineral Point Farmers' Market. Starting with a handful of enthusiastic, optimistic vendors in the park under the water tower, the farmers' market steadily gained momentum to become what it is known today as — "the place to be on Saturday mornings." As the farmers' market grew in popularity, it became imperative to offer a broader product selection to maintain and grow our customer base. Although our initial goal was to remain a producer-only market, we agreed that vendors could also represent items from other Wisconsin companies. In time, we became self-directed, with two full-time vendors filling the role of volunteer market co-managers. With market growth came more to do. In 2013, a third full-time vendor took over a share of the market management. The market is still managed by this volunteer team of three vendors today. Acknowledging the fact that we are located in what may be the best artisanal small community in the Midwest, quite possibly the nation, we agreed to invite local artisans to sell their creations at the farmers' market. As a result, we changed our name to "The Mineral Point Market," speaking to the now diverse group of producers who create with soil, canvas, animals, and more. Over the years, vendors and customers have come from communities near and far: Avoca, Arena, Barneveld, Clyde, Cobb, Darlington, Dodgeville, Fennimore, Lancaster, Linden, Mineral Point, Platteville, Spring Green, and many more. 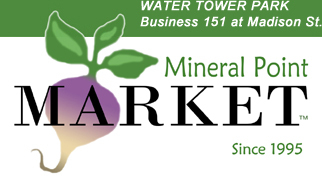 Today, the Mineral Point Market continues to be held every Saturday under the water tower from 8:30 to 11:00 am, beginning the first Saturday in May, ending the third Saturday of October. on market events and producers, please click here.